Today we are going to learn something new, i.e.Verbals. Verbals are forms of verb which is used as another part of speech like nouns, adjectives or adverbs in a sentence. 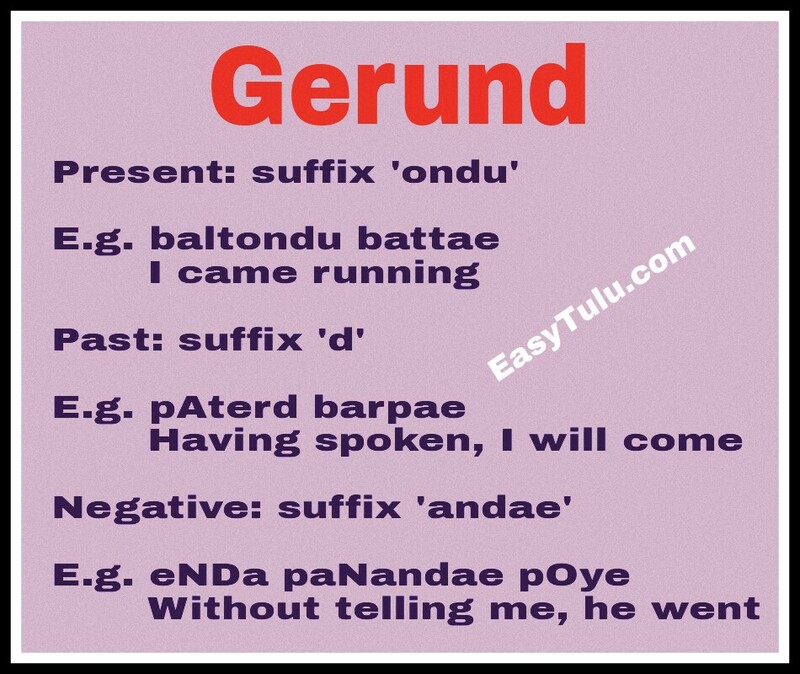 Let us look into only gerunds today. Next week we will cover participles/verbal adjectives and infinitives. 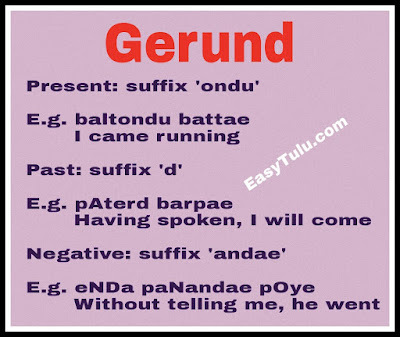 Gerunds are mainly used as adverbs in Tulu. There are three forms; Present, Past Perfect and Negative. 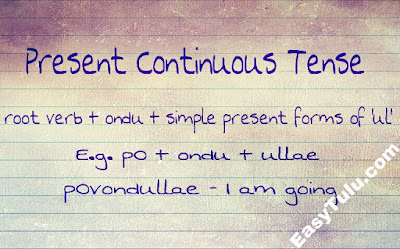 We have already learned this form in Present Continuous tense. This form is used to express the mode how an action is done. English: They are speaking and working. English: River flows and joins the sea. Kannada: nadi haritA samudra sErtade. Tulu: mange maroDdu maroku lAgyondu pONDu. English: The monkey went jumping from tree to tree. Kannada: manga maradinda marakke jigitA hOytu. We have already learned this form in Present Perfect tense. This form is used to express actions in sequence. English: He got up at 8 O’clock, took bath, had tea and went to school. English: Having finished his work, he went home. English: It rained and so I got wet. Kannada: avanu hOgi ondu vasha Aytu. Generally this form gives the meaning of ‘without’. 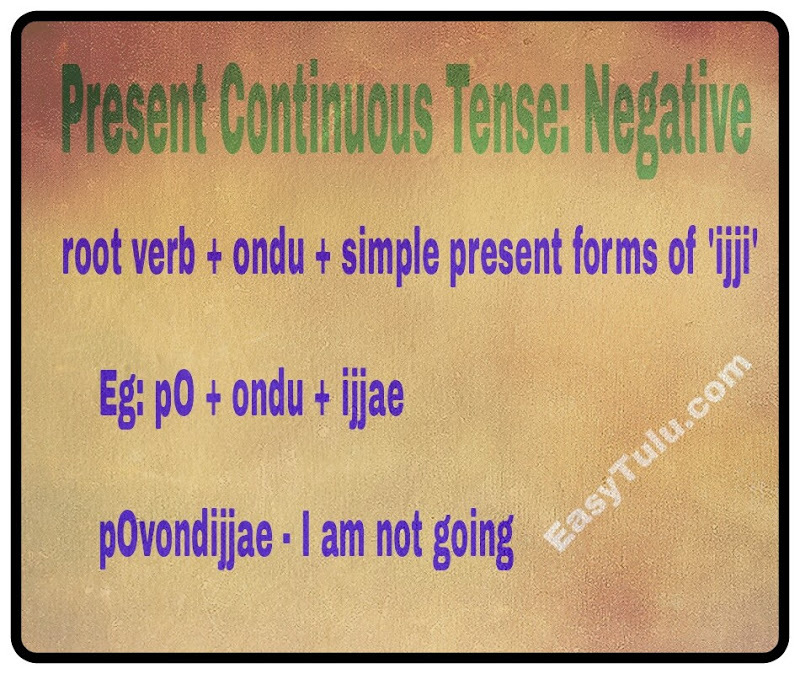 Today we are going to learn negative and interrogative form of sentences in Present Continuous Tense. 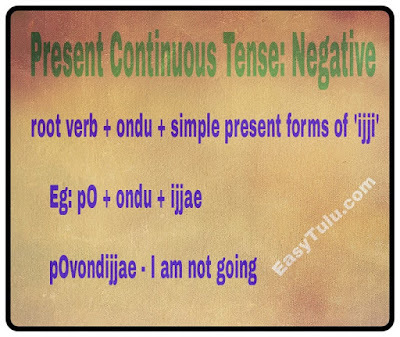 We already know Present Continuous Tense in Tulu. All we need to do is just replace the verb ‘ul’ with ‘ijji’ to make our sentences negative in present continuous tense. English: Birds are not flying in the sky. 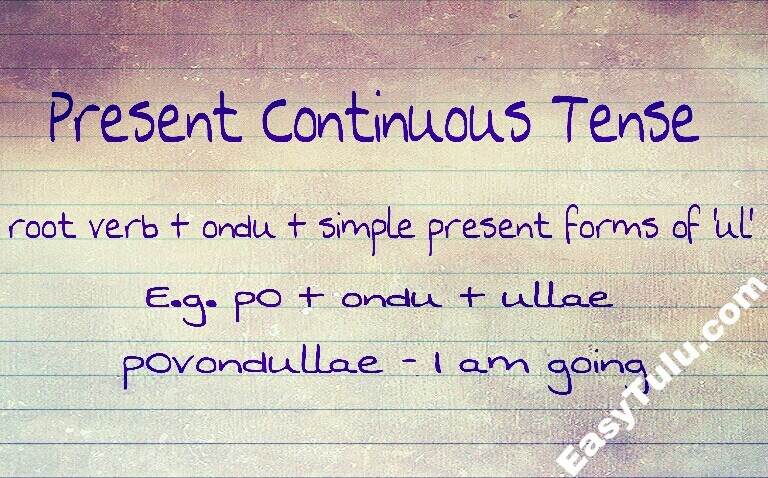 In Tulu Present Continuous tense is also used for Present Perfect Continuous. English: He has not been speaking with me for one year. Kannada: mUru dinadinda maLe bartilla. We have to add ‘a’ or ‘na’ at the end to make interrogative form of sentences in Tulu. When speaking with elders/strangers with respect, you can add ‘e’ or ‘ne’ instead of ‘a’ or ‘na’ at the end. English: Are we going to school? English: Aren’t you reading now? English: Aren’t you having lunch now? Kannada: nIvu Iga UTa mADtilva? Tulu: Aye niNDa dAla paNondullena? English: Is he telling you anything? Kannada: avanu ninnalli EnAdarU hELtiddAna? English: Is the dog barking? English: Isn’t the cat drinking milk? English: Aren’t they calling me? As you see, we use ‘To be’ plus the ‘ing’ form of verbs to express Present Continuous in English. That is to say, we have Subject + am/is/are + main verb + ing. Now, let us see what we should do with the main verb (going). In English, we have added suffix ‘ing’ to the verb ‘go’. In Tulu, we have to add suffix ‘ondu’ to the root verb. One thing you have to remember that when adding the suffix ‘ondu’ to root verbs ending in ‘pu’, the ‘p’ sound changes to ‘t’. English: I have been working here for 3 years. English: She has been waiting for you from the morning. Kannada: nAlku dinadinda maLe bartA ide. How was the last lesson? I hope you had no problem with that. Please comment, if you need any help. Today we are going to learn negative and interrogative form of sentences in Present Perfect Tense. You already know to make verb stems in Present Perfect Tense. If not, please read the lesson 14 again. To make it negative just change the personal endings. Personal endings for negative form of sentences in Present Perfect Tense are same as Simple Past. Note: You may see some people use ‘iji’ ending for first person singular, ‘yAn pOtiji’ instead of ‘yAn pOtijae’ though grammatically it is wrong. We already know how to make the interrogative form of sentences. We have to add ‘a’ or ‘na’ at the end. When speaking with elders/strangers with respect, you can add ‘e’ or ‘ne’ instead of ‘a’ or ‘na’ at the end. Tulu: I untana?/ I onas malt'dana? English: Have you had lunch/dinner yet? English: Haven't you had lunch yet? Kannada: nInu innU UTa mADilva? Tulu: yAn niNDa suruve pantijena? English: Haven't I told you before? Kannada: nAnu ninage modale hELilva? English: Has he met you? English: Has she sung a song? English: Has bus not come yet? English: Have you (pluaral) written exam? English: Have they crossed the river? English: Has the kid slept. That’s all for the day! If you need more sentences translated to Tulu, please leave a comment. 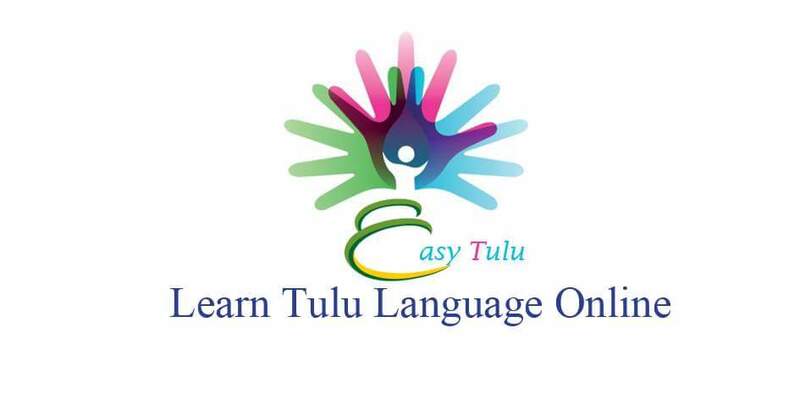 If you find this lesson helpful, please share it with your friends who want to learn Tulu.